Dennis H. Sabourin is Of Counsel with the firm. He is a complete business attorney with in-depth experience in and knowledge of United States and international tax aspects of structuring transactions for most forms of business entities and many types of business transactions, business succession and estate tax planning, senior executive contracts and compensation packages, equity and separation packages and commercial litigation. Mr. Sabourin brings to his clients more than 25 years of experience. 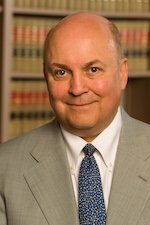 He has significant large-firm training and experience working for many years in two major firms, Carney, Smith, Badley & Spellman, P.C. of Seattle, Washington and Hannoch Weisman, P.C. of New Jersey, where he was a member of both the tax and litigation departments. Mr. Sabourin has a master's degree in tax from the University of Florida, is a graduate of the University of Pittsburgh Law School and earned his B.A. from the University of Vermont.